I only get such a small window of opportunity and when work and family get in the way then my hobby takes a back seat. I must admit I’m missing it. I haven’t been idle though. I built a better practice rig including some rubber diamonds for the back wall and with a small add on piece, it can take a proper 8ft single dealer layout. I will add some pics of it soon. This was very much needed to finally graduate from my cardboard box receiving station which I’ve been using for over a year. 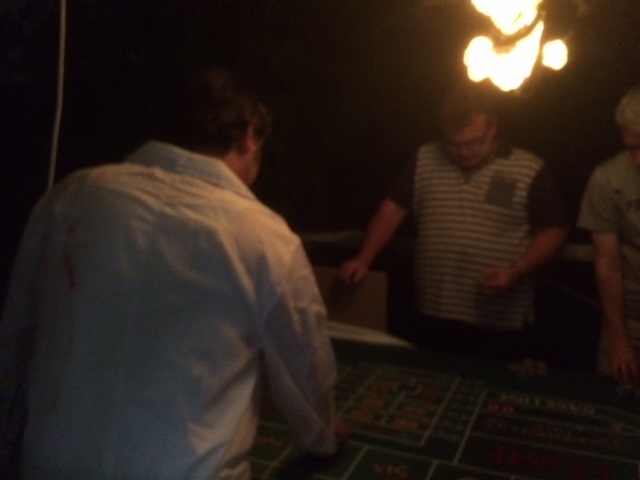 I was going to build a full table with the help from Big Jeff who builds custom craps tables in the USA. He does make truly beautiful craps tables. He sent me 4 diamond rubber back pieces, and some routed chip rails to get me started. So that left me with no choice but to order a cheap custom table from overseas (China) and get it shipped to me in Australia. That was 3 months ago and I still don’t have the table. That’s a whole topic for another day, which I won’t go into today. My new practice receiving station which is 1.2m wide sits on a portable table and I still use my throwing station to get the right distance away from the back wall. I can then practice stick left or right or straight out. The best part of the design is that I can add an extension onto it and use it as a half table with 8ft layout and use it with others to play some craps socially. 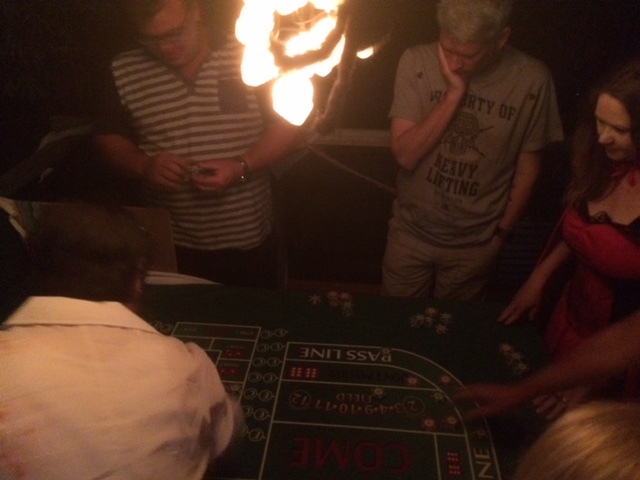 I have yet to introduce my friends to craps and was waiting for the full table to do so. However I could wait no more. We have a standing calendar booking for a Halloween Party each year where we invite neighbours and family friends. 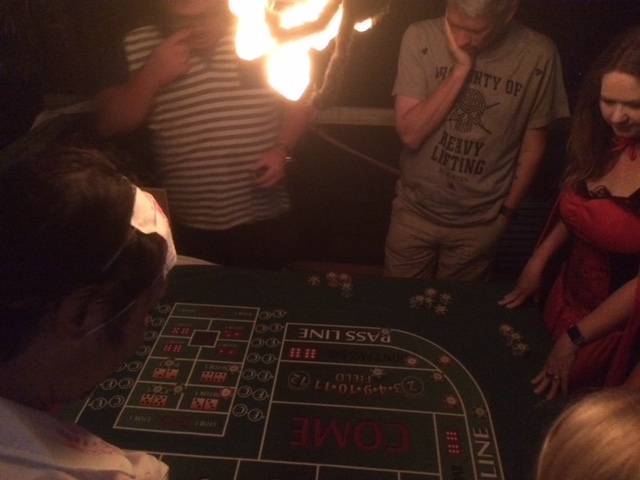 So I took advantage of that, and I got the half table setup on the deck and after dinner and a couple of drinks I opened my first ever floating craps game. See a few photos below. I explained the game quickly and gave each player $300. It was total chaos, but after 10 mins they were getting the hang of it. I struggled to keep track of everyone’s bets. And they were all farming the field and hitting the prop area. Of course just my luck as first time dealer and it was a horn dream run for 30 mins. So I was stumbling over horn and hardways payouts. I explained the dark side being opposite of the right side. And the probability of 7s showing more than any other. And you wouldn’t believe it, but I had 2 out of 6 players playing dark side. I was humbled by that, and I never even pushed them one way or another. They just worked it out on their own. I even let the players place their own place bets and I was just making sure the bets were correct amounts and put them in the right position in the boxes so I could track players bets correctly. It was a huge success and everyone was calling out numbers to hit and having a great time. The other neighbours around must have wondered what was going on. Initially I didn’t bother getting out the $100 and $500 chips since I just figured everyone would crash and burn and that would be that. But they were all doing great. And I had to break out the $100 and $500 chip stacks to keep the bank afloat. The game would have kept going for hours. But after 1 1/2 hours I had to call it, since I needed a break. I got them to colour up and was pleasantly surprised that 5 out of 6 had profit. Some had a lot. One had $25 left. He was not happy. The winner was around $1200 with second $1100. So it was a close race. The winner was one of the dark side players. Which I was the most proud of. 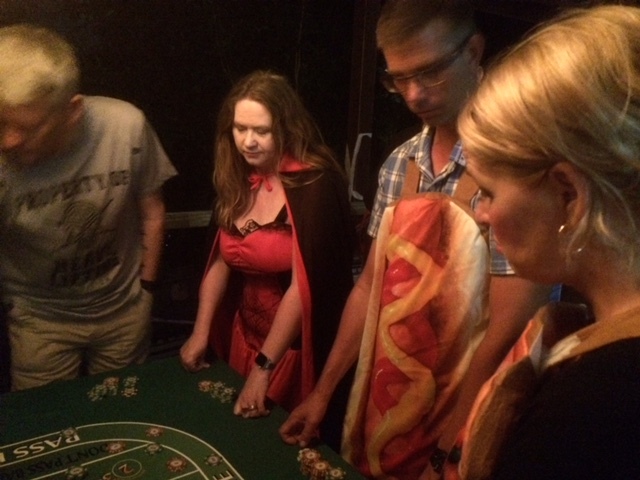 Who was also the only one really betting the place bets and using it like a cash register. One thing I noticed being a dealer is not easy by a long shot. Especially a green solo dealer with no backup. I can’t wait to get my full table. Then we’ll really get some social craps play happening. This little gathering and the way they approached the table for the first time, and how each set their game plan, once they knew the basic rules, could easily make for a study in human behaviour. Being that I knew the players, watching them interact with each other and play gave me great insight into how parallel their play was with their personalities. I don’t see that sort of thing happening with other games at the casino. Just underlines what a great game craps is.